Home > Online opportunities > 24/7 Wealth Club SCAM? Review exposes the HIDDEN TRUTH! 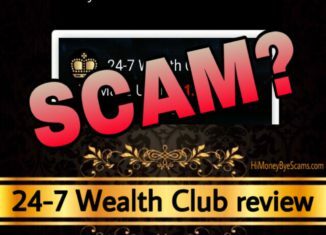 Will 24/7 Wealth Club scam you out of your hard-earned money? Or is this a legit system that will help you make $13,127 per week? If that’s what you want to know, I’m glad that you have landed on my 24-7 Wealth Club review because here I reveal the pure truth about this program. You know, there are so many scams out there, so it’s great that you are doing your own research before making another purchase. That’s the way to avoid frauds and discover the honest way to generate passive income every day! When it comes to 24/7 Wealth Club, the truth is that it’s not as amazing as they have told you and there’s important information they are hiding from you, so here I am to unveil their secrets. 2 What is 24/7 Wealth Club about? 3 How does 24-7 Wealth Club really work? 3.1 Who’s behind 24-7 Wealth Club? 3.2 Has anyone succeeded with this program? 5 What does it take to make passive income every day? What is 24/7 Wealth Club about? The 24-7 Wealth Club sales page reminded me of other sales pages I had come across before, so I didn’t have high hopes for this program. I still gave it a chance and decided to look deep into it before coming to a final conclusion, since we can never judge a book by its cover. According to the spokesman, you have got access to the sales page because you have been selected to one of his multi-millionaire business partners. He claims they believe you are a prime candidate to earn up to $13,127 per week with this system, but he doesn’t give you any reason. I have heard this kind of claims plenty of times in other sales pages and the truth is that no one gets selected. These marketers send these “systems” to lots of people, so I believe that they claim you have been selected to make you feel special. Just the fact that he claims you can make up to $13,127 in your first week is a very big red flag, since making an online income doesn’t work that way. You allegedly don’t need any previous experience or special skills, so he’s basically telling you that you can start making money easily and without doing much work. Everything he says makes this system sound like a get-rich-quick scam because making thousands of dollars online is not that easy or fast. The whole sales video is basically about how much money you can make and how life-changing this system is, but he doesn’t show any proof to back up these claims. His goal is to get you excited so that you buy this program because he merely tells you what you would like to hear. He’s not honest about what this system is about. He claims this is not about online surveys, cryptocurrencies or anything illegal, but he doesn’t mention the method or business model you’ll be using to make money. The only thing he says about how this system works is that the more people who use it, the more he earns. So this system is apparently a win-win situation. However, I don’t believe in what he says because of several red flags I have seen in the sales video and sales page. For example, it’s not true that there are only 9 spots left. It makes no sense that they only want to make 9 sales because they want to make as much money as possible, so pay no attention to people who claim there are limited spots left. How does 24-7 Wealth Club really work? 24-7 Wealth Club doesn’t work to benefit you, it works for the owners to profit themselves because if you pay for this program, you are not going to make money fast. The ones who make money once you have paid are the people who have created it. You will definitely not get a done-for-you system that you can use to earn thousands of dollars within a short period of time. Instead, you will get some basic information on how to make money online. In fact, the information provided is not even enough to make the kind of money they talk about. If many people believe in what the spokesman says, the ones who will make thousands of dollars it’s him and whoever is behind this product. Why doesn’t the spokesman show what you are getting into? Why doesn’t he mention the business model that you are going to use? Yes, he says that this is a win-win system, but by saying this he could mean that you are getting some training for your money. You are definitely not getting a money-making system. So yeah, you definitely get some training, but the questions are: Will this training benefit you? Is it worth your money? In my opinion, it is not worth it because the information provided can be found online for a very very low price or even free. Also, this kind of products usually provide guides that are out of date, which means that what they teach probably doesn’t work anymore. Even if what they teach work, this is not something you can rely on to make money overnight. Making money online doesn’t work like they have told you, it takes work and time. Just because it’s online, it doesn’t mean it’s easier or faster than if it was offline. Surely, the fact that it’s online makes it better to reach more people and make more money, but this is not something that happens fast or without making efforts. Who’s behind 24-7 Wealth Club? According to the spokesman, his name is Richard and he’s the owner of 24-7 Wealth Club. He claims to be a writer and researcher with the focus on online business. However, I don’t believe what he says for several reasons that I’m about to explain. First of all, he doesn’t mention his surname and he doesn’t show his face. How can we confirm he’s a real person? Why is he hiding his indentity? If he’s a millionaire, don’t you think he would be proud and confident enough to show who he is? Second of all, he doesn’t say how we can get in touch with him or whether he has a website or social networks. If he really cared about us, don’t you think that he would tell us what to do in case we have questions or issues? If he’s making money online, don’t you think he must have a website or at least be available on social media? Third of all, I’ve heard the same thing in other ClickBank products such as CB Wealth, Wealth Project and Fast Cash App. The sales videos for these products were very similar to the 24-7 Wealth Club sales video and the owner also claimed to be a writer & researcher. Because of this, I believe that the owner of 24-7 Wealth Club is not Richard and it’s the same marketer who has created these other products I have mentioned. Has anyone succeeded with this program? The spokesman mentions some people who have supposedly been earning thousands of dollars with 24-7 Wealth Club, but he doesn’t show any pictures or real proofs. I mean, it’s so easy to say or mention someone and anyone can do it. But proving it is essential, especially when it comes to marketing a product because potential customers want to see if it really works. In my opinion, these success stories are invented and the owners & their affiliates are the only ones who are making money with this program. Not only that, it wouldn’t make sense that members were already making money because 24-7 Wealth Club has recently come out, so it’s still too soon for people to achieve success with this program. The fact that the success stories are not genuine is enough for me to believe that 24/7 Wealth Club is not as amazing as they want us to believe. According to “Richard”, you only need to spend $37 to start making thousands of dollars, but that’s not true. The truth is that he wants you to believe that you don’t need to spend much money to start making money. So, they will try to make you spend at least $508 (taking the main product into account)! This is the minimum they want to earn per customer, not only $37. You see, it would make no sense that they only wanted to make $37 per buyer because they would need a lot of buyers to make the thousands of dollars they talk about. Affiliates who promote it can make a 75% commission per sale, which is cool to some affiliate marketers. I’m an affiliate marketer myself, but I don’t promote this kind of products because they don’t live up to their promises. For me, saying that this programs works would be ripping people off, which is unethical and cruel to people who fall for this. I don’t like the fact that they are hiding how much it really costs, since knowing the total cost is important to determine whether you want to get involved or not. Not only that, if you don’t buy 24-7 Wealth Club but give them your email address, you can expect them to send you emails about this program or other scammy products. So, will 24/7 Wealth Club scam you? It depends on your expectations. If you consider that you get something for your money, then it wouldn’t be a scam. But if you buy this program with the expectation that you will make thousands of dollars, then you will feel ripped off. I know lots of people will call it a scam because the sales presentation is very misleading and full of lies & red flags. However, I don’t consider it to be a total scam because it’s a product sold on ClickBank, which means that you can get a refund in case you buy it but don’t like what you get. I personally have decided not to purchase it because it’s clear that it’s like the other products that overpromise but underdeliver. With that said, you can do whatever you want but I will not be recommending it. These are just my thoughts and I hope this 24/7 Wealth Club review has given you an idea of what this program is really about. What does it take to make passive income every day? 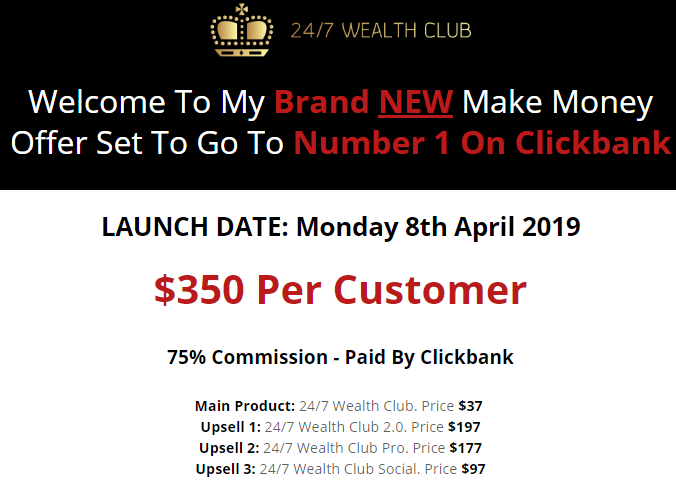 I remember that when I was getting started, I used to waste my time on programs like 24-7 Wealth Club because I still had the hope that there would be some kind of secret website that could work to make money overnight. 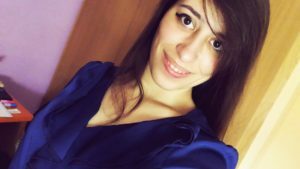 However, soon I realized that those kind of websites only made money to the “gurus”, so I stopped wasting my energy on them and started looking for other alternatives. I’m grateful that I learned about affiliate marketing, which is the business model that has given me a way to earn a 4-digit monthly income online. To be honest with you, I had to put in the effort and time to reach this point, so this is definitely not for people who are not willing to put in the work. You see, I’m living proof that this business works, so if someone like me can do it, anyone can! As you can see, I’m not hiding my identity like the owner of 24-7 Wealth Club does. Instead, I’m showing you who I am, Miren Ribera. Like anything new that you start, you will have questions and doubts. But if you read my guide until the end, you will discover how you can get my guidance and how you can receive support from thousands of affliate marketers! And now let me ask you: Will you keep wasting your time on money-making products that don’t work? Or will you get on the right way to start building your biz today? I hope this 24-7 Wealth Club review has been helpful to you and you will make the best possible decision. Not sure about 24/7 Wealth club scam, as these systems.do tent to provide some training that can be benefit to newbies. However, the way that this program is presented is very vague and hyped up so I’m not convinced this is the best way to get involves in the online business world. I will rather try out your recommendation than jump with my two feet, into an obvious trap, with my eyes open. Thanks for your review on the 24-7 Wealth Club, it would help many and save them from being scammed. The give away for this platform that it’s a scam, is their bogus claim that those that sign up can make a humongous $13000 per week! That’s a too obvious lie. You’re right, they make this system sound like a scam when they make that high income claim, it’s one of the most exaggerated sales presentations I’ve seen. Thank you for this wonderful review. Indeed there are so many online scam sites now that have really made interested online marketers avoid online marketing which is not suppose to be. However as you’ve rightly said, it is important to make enormous review before registering with unfamiliar sites. Online marketing is not a get rich quick medium especially for beginners. I was once nearly scammed into a program like this. Now I know that there is no such thing as making so much money in one week with no training or work experience. It was thanks to a review like yours that stopped me from handing over my credit card details. There are honest ways to make a living online and sadly there are too many scams out there. Thanks for making us all aware of this! Is Income League a scam? Matthew Neer’s product reviewed! Is Tube Profit Sniper a scam or $500/day from YouTube? Full review!